Ideal for golfers, Springs Towers offers three-bedroom, two-bath oceanfront North Myrtle Beach condominium rentals in the Cherry Grove section of North Myrtle Beach, South Carolina. Cherry Grove is a unique area of North Myrtle Beach, South Carolina because it not only enjoys beach access and ocean views, but it also borders a salt marsh. Many channels off the salt marsh run between rows of residential homes. Sea grasses and wading birds in the inlet are natural wonders that are not visible everywhere throughout North Myrtle Beach, South Carolina, but they are prevalent in the Cherry Grove stretch of North Myrtle Beach, South Carolina, the beautiful oceanfront location for Springs Towers. Inside these spacious oceanfront North Myrtle Beach condos, you will discover comfortable furnishings and convenient amenities, such as a full kitchen with a dishwasher. Experience oceanfront views from the oceanfront balcony at Springs Towers North Myrtle Beach condominium rentals. Feel the sea breezes come in off the Atlantic Ocean and hear the crashing waves that are just beyond the boardwalks that cross the sandy dune line. An inspiring vista, the only way it gets better is to view it while barefoot from the white, sandy beaches below. Bring your favorite book along and grab a beach chair for a relaxing afternoon where you bask in the North Myrtle Beach sun while the waves lap at your feet. 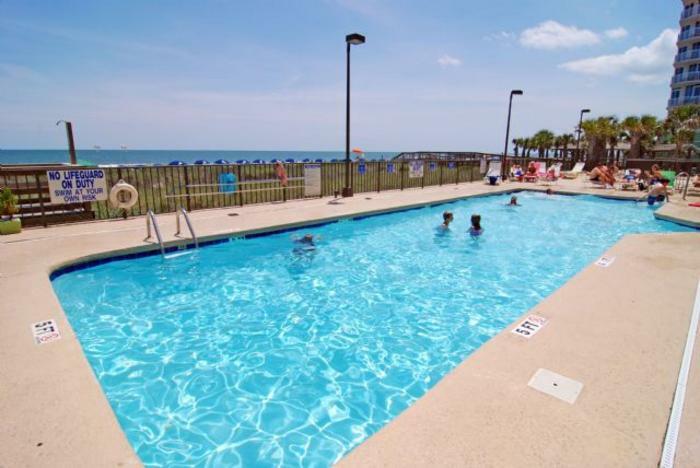 Knowing you are only steps from retreating to your Springs Towers North Myrtle Beach condominium rental is reassuring when you need a bite to eat or want to take a swim in the sparkling blue swimming pool. The covered kiddie pool is a favorite among the children and the hot tub is simply fabulous after a long day on the championship golf course. Springs Towers also has a grill area next to the oceanfront lawn. Hop in the car for a quick ride to some fabulous waterfront dining, live dinner theatre entertainment and plenty of shopping. Nearby family amusements include water parks, parasail rides, fishing opportunities, miniature golf and of course, championship golf. From par-3 courses to executive 18-hole courses that are lit at night, North Myrtle Beach golf courses challenge all skill levels and promise a good time. Make your reservations today for Springs Towers in North Myrtle Beach, South Carolina. Elliott Beach Rentals is not affiliated with onsite management or the HOA of Springs Towers.